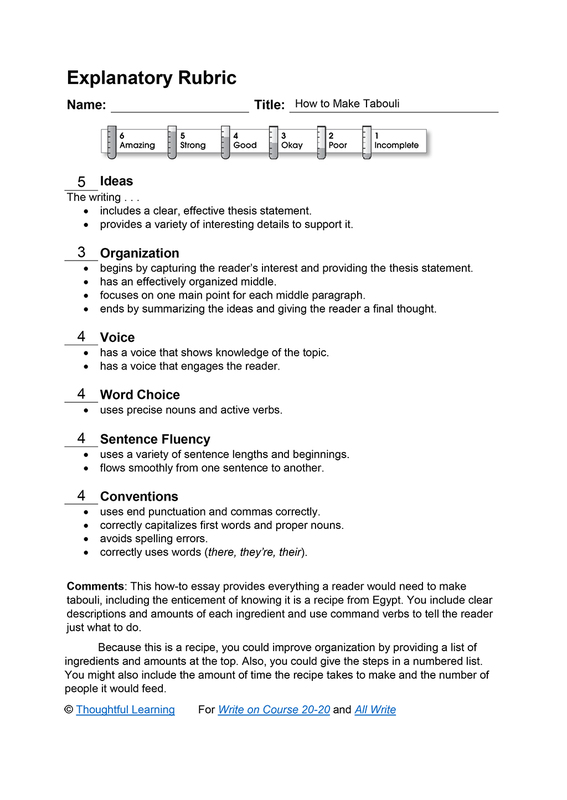 This middle school how-to essay is a good example of explanatory writing. When my uncle came back from Egypt, he showed me how to make a salad called tabouli. Begin by measuring one cup of bulgur. (Bulgur is cracked wheat.) Put the bulgur in a large bowl. Wash it by adding water and then carefully pouring off the water. Add fresh water and let the bulgur soak for two to three hours. Then put three tablespoons of olive oil and three tablespoons of lemon juice in a large salad bowl. When the bulgur is soft, drain off all the water. Put the bulgur and the diced vegetables in the salad bowl. Toss until everything is mixed together well. You can eat the tabouli right away or chill it first. People in the Middle East use their fingers to scoop some tabouli onto a lettuce leaf. They roll the leaf around the tabouli and pop it into their mouths. How to Make Tabouli by Thoughtful Learning is licensed under a Creative Commons Attribution-NonCommercial-ShareAlike 4.0 International License. Based on a work at k12.thoughtfullearning.com/assessmentmodels/how-make-tabouli.